a. Including Equatoguinean Spanish (Español ecuatoguineano). The Republic of Equatorial Guinea is a nation in west central Africa, and one of the smallest countries in Africa. It borders Cameroon on the north, Gabon on the south and east, and the Gulf of Guinea on the west. In the past, it was the Spanish colony of Spanish Guinea. The country's territory is both on the continent and on islands. The continental part is known as Río Muni. On one island, Bioko, is the capital, Malabo. 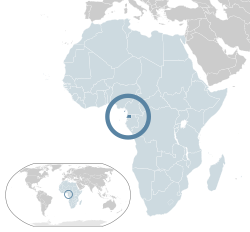 Equatorial Guinea is the only country in Africa where Spanish is an official language. The provinces are further divided into districts. ↑ 3.0 3.1 3.2 3.3 World Development Indicators database, World Bank, accessed on 23 August 2011. ↑ "Human Development Report 2009. Human development index trends: Table G" (PDF). United Nations. Retrieved 2009-10-10. This page was last changed on 15 June 2018, at 09:06.